San Antonio has b ecome quite the foodie hotspot in recent years with much of the culinary revolution happening near downtown, Broadway & the Pearl Brewery– energizing previously stagnant areas of real estate. The influx of new condo and apartment buildings & remodeling of fixer-uppers has attracted many pet parents to these areas, and where there are pet parents there must be pet friendly neighborhood restaurants. Here’s our first list of some great hometown culinary spots where the food & drinks are interesting & our fur babies are welcome. Owned and operated by local Chef Andrew Gutierrez, this homemade ice cream shop offers uniquely flavored treats that bring back the ‘ol San Antonio nostalgia of buying ice cream from the neighborhood ice-cream truck. Some of their unique flavors include: pistachio dipped in chocolate, Mexican chocolate, roasted banana, pecan & pink lemonade. 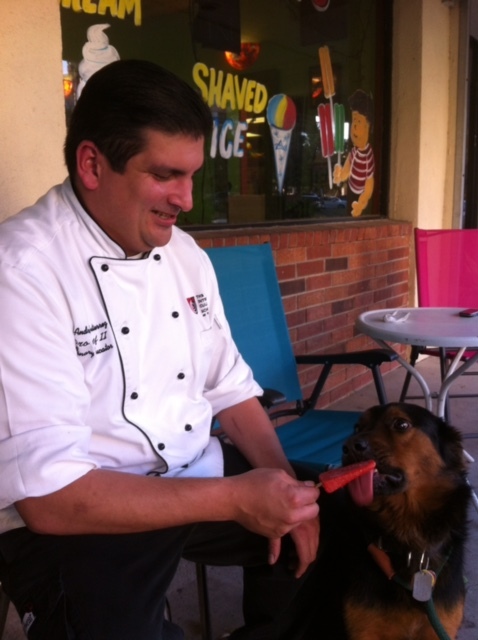 People and pet friendly – so feel free to pop in for a Popsicle with your pooch and sit on the patio (say that 3x times fast). Resident Coffee artists, John & Whitney Sanchez, are bringing passion and quality to our daily caffeine fix in a retro & friendly atmosphere. The folks at The Fairview possess knowledge of their coffee products & truly pride themselves on the artisanal quality of what they create. Some highlights of their menu include: “El Chingon” (a Horchata & Espresso iced infusion), the Chai (homebrewed from spices & sweetened with Texas raw honey), along with exotically flavored waffles, breads & muffins. 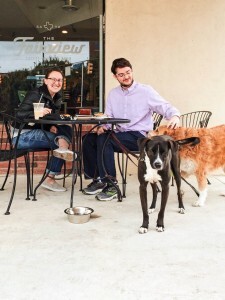 Patrons & their pups are invited to enjoy coffee on their patio. This unpretentious craft cocktail bar has quickly become a neighborhood fixture in the N St Mary’s area. San Antonio native, Chef James Moore, has established an atmosphere of artistic cocktails like the “Juan Collins”, “Rye n’ Gosling” & the ode to the recently gentrified SoFlo district downtown – the “South Flores”, with low key, grilled cheese sandwiches to snack on. Chef James routinely takes his rescue dog to the bar and welcomes patrons to bring their pups to relax on the patio as well. This new kid on the block near the Pearl will be offering American casual fare with a chef twist, craft cocktails, craft beers & homemade soda. Grayze is the first restaurant by Center Cut Concepts, a restaurant group made up of local Chefs & entrepreneurs and is slated to be a less expensive alternative to the restaurants at the Pearl Brewery. The restaurant will be extremely pet friendly with house made gourmet dog biscuits, large front and back patios where you can hang out with your pooch, a water bowl brought for each outdoor table with a furry visitor & green space for your pups to stretch their legs.